KALIAN produces about 9000 bottles of Monbazillac per year. 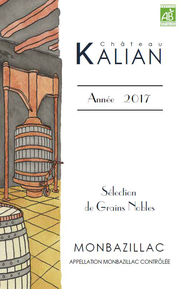 KALIAN's Monbazillac is made from white grapes grown on 9 hectares at the estate. Sémillon (85%) and Muscadelle (15%) are the two varieties that are blended to create the Monbazillac. The vines are either spur pruned or caned pruned (guyot) depending on the parcel's production history. The density is between 5000 and 5500 vines per hectare. The average age is between 45 and 50 years old. The yield, depending on the years, can range from between 12 to 20 hectoliters per hectare. 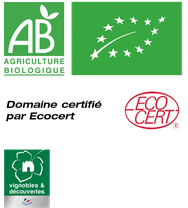 The maximum yield allowed in the appellation is 27 hectoliters per hectare. The harvest, which is done completely by hand, consists of different passes to select botrytised berries (between 3 and 6 times depending on the vintage). Aging occurs in French oak barrels for between 10 and 24 months depending on Monbazillac wines and vintage. Please contact us about older vintages (1992 to 2009).